Genea-Musings: Amanuensis Monday - 1748 Will and Court Records for Estate of Samuel Brown (1686-1749) of Eastham, Mass. 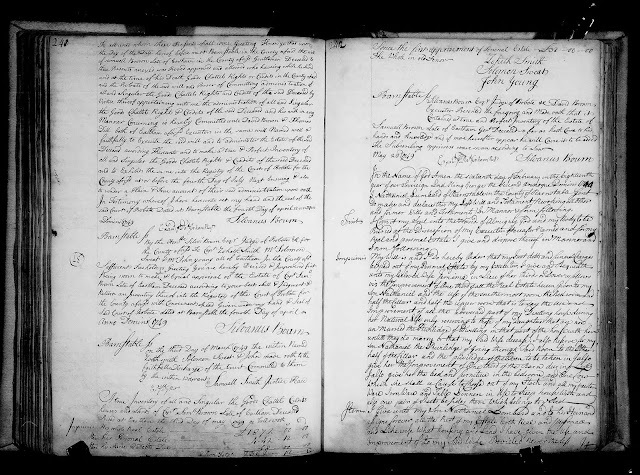 Amanuensis Monday - 1748 Will and Court Records for Estate of Samuel Brown (1686-1749) of Eastham, Mass. In the following Manner & form. My will is my son Isaac shall help her to what she shall have Occation for. I have given her one bed already. Notherly side of the way and one featherbed and a Cow. highway and one feather bed & a Cow. all my above Named Children. the rest of my said Stock to be Divided Equally amonghts all my above Named Children. to be my Executors of this my Last will and Testament. Jun^r Set to their hands as witnesses thereof in Presence of the Testator. to render a Plain & True account of their said administration upon oath. Prised at Eastham the third Day of May 1749 as followeth. The Subscribing apprisers were sworn according to Law. "Massachusetts, Wills and Probate Records, 1635-1991," indexed database with digital images, Ancestry.com (http://www.ancestry.com : accessed 6 December 2016), Barnstable County > Probate Records, Vol. 8, 1745-1753, pages 238-242 (images 137-139 of 309, Samuel Brown, will proved 4 April 1749. 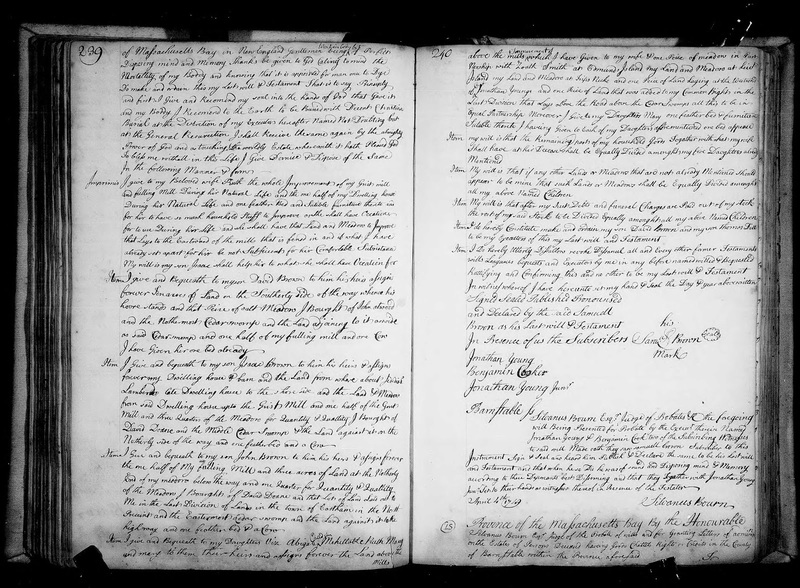 In his will, written 24 March 1748 and proved 4 April 1749, Samuel Brown names his wife Ruth and eight children - sons David, Isaac and John, and daughters Abigail (deceased? ), Mehitable, Ruth, Marcy and Mary. The executors were son David Brown and "son" Thomas Dill, who married Mehitable Brown (1714-1758) in 1734. The estate is significant - it totaled £2389 in old Tenor! Wife Ruth (Young) Brown received a significant portion of the estate but there is no probate record for her in the Barnstable records. Samuel and Ruth (Young) Brown are my 6th great-grandparents, through their daughter Mehitable (Brown) Dill. Even though this is a very common given name and surname, the children mentioned match well with the children in the Eastham records, and the fact that "son" Thomas Dill is an executor clinches the conclusion for me that this is the correct Samuel Brown the father of Mehitable (Brown) Dill. There may be other probate records for Samuel Brown in the Barnstable Probate Court records, but I need to consult the probate index to determine if they are available.